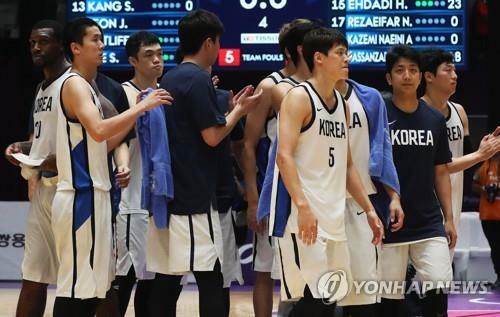 JAKARTA, Aug. 30 (Yonhap) — South Korea failed to reach the men’s basketball final of the 18th Asian Games after suffering an 80-68 loss to Iran on Thursday. Naturalized player Ricardo Ratliffe, whose Korean name is Ra Gun-ah, had his fifth double-double with a game-high 37 points and 12 rebounds in the men’s basketball semifinal at Gelora Bung Karno (GBK) Istora arena in Jakarta, but it wasn’t enough for South Korea to overcome the tall Iranians. Iran out-rebounded South Korea 47-27 and outscored them 48-20 in the paint. Former NBA player Hamed Haddadi, listed at 2.18 meters, bagged 23 points, eight assists and seven rebounds and led Iran to avenge their 79-77 defeat to South Korea in the final at the 2014 Incheon Asian Games. South Korea, in losing its title defense bid, will next face Chinese Taipei for bronze on Saturday. Chinese Taipei lost to China 86-63 and fell to the third-place match. Iran got off to a 6-0 lead in the first quarter, forcing South Korea to call a time out after less than two minutes. Ratliffe tried to help South Korea stay in the game with his shots from the perimeter. He took care of 10 of 14 points that South Korea scored in the first quarter, but Iran was too strong with Haddadi dominating the paint. Haddadi scored 13 of Iran’s 21 points in the first quarter. Early second quarter, South Korea got as close as 23-18, but couldn’t cut the deficit further. 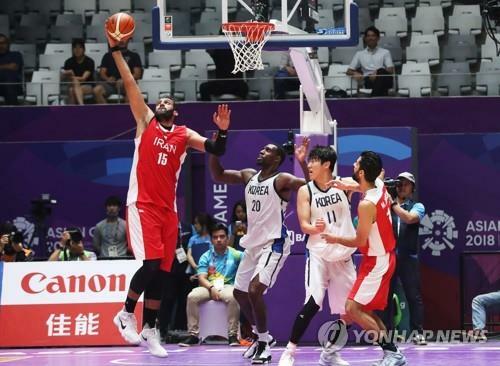 While the South Koreans struggled to contain Haddadi, players like Mohammad Hassanzadeh and Behnam Yakhchaldehkordi also started to get buckets and South Korea entered halftime trailing 40-28. Ratliffe hit two quick buckets for South Korea to start the third quarter, but Iran later made a 9-0 run to extend its comfortable lead. Ratliffe performed a two-hand slam dunk at 1:43 in the third quarter, spicing up the mood for South Korean fans, but Yakhchaldehkordi silenced the crowd with his three-pointer. South Korea outscored Iran 20-17 in the fourth quarter, but it couldn’t change the result of the match.